This false-color composite image, taken at a region of the rock outcrop dubbed "Shoemaker's Patio" near the Opportunity rover's landing site, shows finely layered sediments that have been accentuated by erosion. 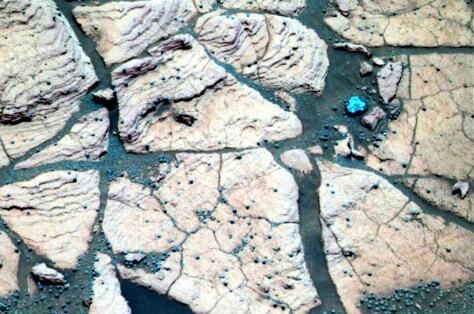 Spherelike grains or "blueberries" can be seen lining up with individual layers. This observation indicates that the spherules are geologic features called concretions, which form in pre-existing wet sediments.